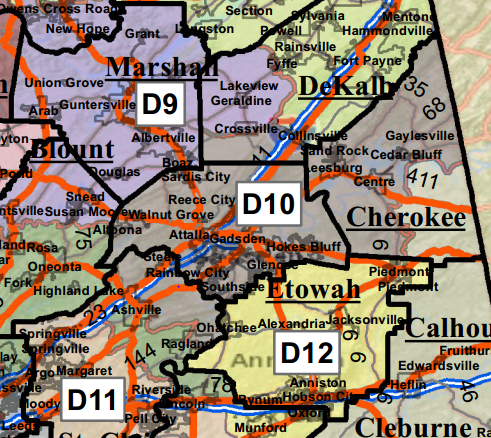 Senate District 10 is arguably one of the most beautiful Districts represented in the Alabama State Senate. Comprised of all of Etowah County, southern DeKalb County, northeastern St. Clair County, and two-thirds of Cherokee County in the northeastern portion of the state, District 10 has approximately 136,000 constituents. Some of the major natural landmarks are the Coosa River, Weiss Lake, Chandler Mountain, Noccalula Mountain and Falls, Cherokee Rock Village, and the foothills of the Appalachian Mountains. The County seats for each of District’s counties are the cities of Gadsden (Etowah County), Centre (Cherokee County), Ft. Payne (DeKalb County), and Pell City and Ashville (St. Clair County has two county seats). Gadsden is home to two major regional medical centers. Etowah, Cherokee, and St. Clair all have regional airports, while the Ft. Payne Municipal Airport serves DeKalb County. Interstate 59 passes through the District, as does US Highway 431, US Highway 278 and US Highway 411, all of which makes District 10 central to Birmingham, Atlanta, and Chattanooga. District 10 contains six separate school Districts: Gadsden City, Attalla, Etowah County, Cherokee County, DeKalb County, and St. Clair County, with approximately fifty schools. The District also boasts two major community college campuses; both from Gadsden State Community College, with its strong academic, professional, and technical schools. The University of Alabama maintains an annex in Gadsden, and Jacksonville State University and the University of Alabama-Birmingham are both fewer than 50 miles from the District’s borders.